WordPress, being the most used CMS in the world, has become “quite naturally” subject to massive and frequent attacks from spammers and hackers. When it is not the platform itself, it is the popular plugins that are affected. Remember the Slider Revolution plugin vulnerability? Do not wait to wake up one morning to a hacked site, a blank page or a message from your host provider telling that you have exceeded the resources provided by your subscription following a DDoS attack. Act now, improve the security of your WordPress website today without wasting another second! Of course, it is impossible to have a 100% protected website, but with preventive security measures, such as installing a security logging plugin and choosing a managed WordPress hosting provider you can evade such problems. 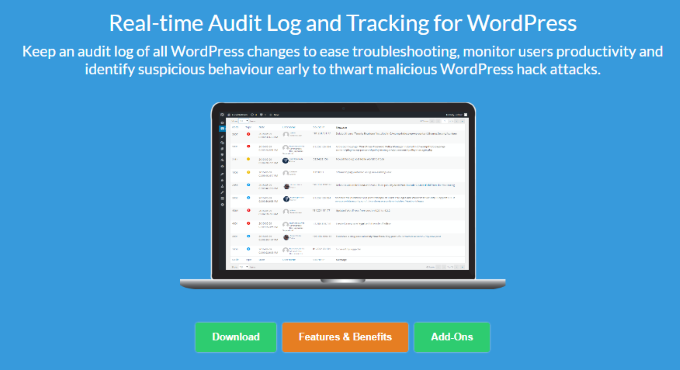 WP Security Audit Log is a plugin that keeps track all the activity and changes done on your WordPress sites and blogs, including multisite. Therefore it lets you identify suspicious activities, so you can take all the necessary actions to avoid getting hacked. Here is an example; the WordPress login page (wp-login.php) is one of the most common targets for hackers, who are seeking to gain access to your WordPress dashboard through a brute force attack, during which they automatically test all the possible username/password combinations. To reduce the risk of brute force attacks, you can configure an email notification with the WP Security Audit Log plugin so you can track or block access to wp-login.php or limit the number of connection attempts. If someone tries to get into your dashboard, wouldn’t you like to stop him from doing harm to your site? I believe, YES! The WP Security Audit Log plugin is a good and must have preventive audit log solution, though logging is only one part of the story. WordPress website owners should also invest in a secure web hosting environment, which culminates the security risks smoothly. Which Type of WordPress Hosting Is Suitable for Your Website? To cater for the various types of users and the requirement of the rapidly evolving businesses, web hosting providers now offer a variety of hosting solutions, ranging from simple shared hosting to fully-fledged and featured cloud solutions. The aforementioned hosting types are the traditional ones, but they don’t live up to the mark for most of the WordPress websites. Shared hosting means that several websites are hosted on the same physical machine and if one website starts getting more traffic than the pre-configured resources, the whole server and all the websites on that server can be taken down or will start experiencing problems. However, it is considered as the most economical type of web hosting, especially for hobby websites. Unlike Shared hosting, with Dedicated hosting the resources are all reserved specifically for your website. It is one of the most expensive solutions because you are paying for a dedicated server, even if you do not use all of the resources assigned to you. 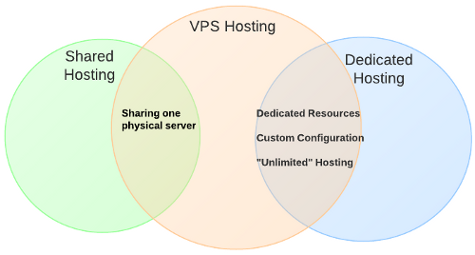 A VPS or a Virtual Private Server is a hybrid system; multiple virtual servers running on a single physical machine. The storage is shared amongst other users, but every virtual server has its own CPU and dedicated memory allocation. Cloud Hosting Servers is the most flexible hosting solution for growing businesses because it is easily scalable as per your site requirements. It basically runs on “pay as you go model” which allows you to pay for the resources you consumed. In the CMS and WordPress ecosystem, web hosting providers have even more advanced and custom-tailored solutions; managed cloud hosting. In managed cloud hosting you do not have to worry about the website or server downtime, or security-related issues. In fact, all the technical and server-side issues are taken care by the hosting provider. Here is an example based on Cloudways, one of the leading cloud hosting provider in the cloud industry. Firewall: All WordPress websites hosted on Cloudways are protected by their highly-sophisticated firewalls. Therefore if a specific WordPress vulnerability is being exploited in the wild, you do not have to worry about it because the Cloudways firewall will protect your website against it. DDoS Protection: Cloudways protects your WordPress websites from DDoS attacks and keeps your server active all the times. Therefore in case of a DDoS attack Cloudways will handle it without your website experiencing performance degradations. CloudwaysBot: The Cloudways smart assistant CloudwaysBot, notifies you about hosted servers/applications and provides real-time performance and updates, which include: Disk Health, Backups, Server Upgrade and SMTP Add-on Suggestion, Application Updates and Settings, etc. Server Monitoring: Cloudways monitors your WordPress websites 24/7, 365 days a year and periodically sends insights about your server’s bandwidth usage, disk storage, performance, and server load time via CloudwaysBot. SSH & SFTP Access: Many hosting providers still allow FTP connections, during which data, including the credentials are sent in clear text. On Cloudways only SSH and SFTP access is allowed, which means you can securely transfer data files on the server with full confidence because the data is encrypted. Updated OS and Applications: You do not have to worry about patching your server’s operating system or applications. Cloudways always uses the latest version patches them for you, so you are always one step ahead of the hackers. Randomly Generated Credentials: When you create a new user account Cloudways always auto-generates the password, including the default WordPress and database credentials. Complex credentials are of course the fundamentals of a secure website and web server. Backup: The backup solution is one of the most overlooked security best practice. Cloudways provides a backup solution to all its users, which can also be used in case the website is damaged or data is overwritten. Data can be restored with just one click. Cloudways offers an hourly backup solution too. 24/7 Live Chat Support: You can have the best hosting provider in the world, with the best infrastructure, but if they do not have 24/7 support then they’re not worth considering. So worth mentioning that Cloudways Support Team is available 24/7, 365 days a year. Cloudways is not just another hosting provider, with a warehouse full of servers in the middle of nowhere. They are partnered with world renowned technology providers, such as DigitalOcean, Vultr, Amazon Web Services, Google Cloud Live Platform and Kyup to offer cloud-based server infrastructures for different clients with different needs, including small-to-medium-size business. Through such technology partnerships Cloudways are also able to achieve an uptime of 99.9%. As we’ve seen WordPress security is not a one stop solution, there is a lot one needs to think about; firewalls, hardening, logging etc. It might sound like a lot but it isn’t. We are making it simple for you; with WP Security Audit Log Plugin and managed WordPress cloud hosting by Cloudways you should be able to considerably enhance the security of your WordPress websites and blogs. There you go! Do you have questions, comments, solutions or other tips to share to make WordPress more secure? Leave a comment below!